A show that was popular a couple of years ago was known for the five words that formed a single question. The question was the title of the show: Who Wants to Be a Millionaire? What are you doing to stay focused on these three words? 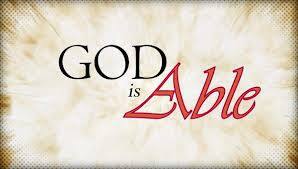 I suggest that every time you open or shut a door, remember to say: “God is able.” If you do this, God might open a door for you. Apostle Paul, God is able, Good is good, grace, Maercy, pen door, promises, questions, Regis, Timothy, Who Wants to Be a Millionaire?